It was the same story over and over at a public hearing this past Friday, presided over by Secretary of Health and Human Services JudyAnn Bigby. Speaker after speaker urged Bigby and her panel of EOHHS assistant secretaries and commissioners at the Agganis Arena at Boston University not to cut the budgets of their programs. 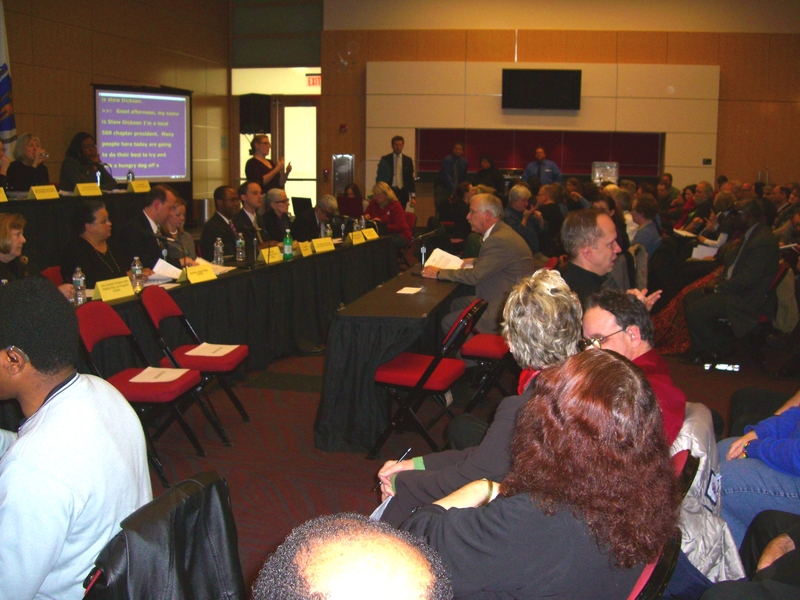 The hearing room was packed with some 300 people, many of them disabled, and many of them program providers. Some of those testifying, such as Hang Lee of Multi-Cultural Independent Living Center of Boston and Paul Spooner of the Metro West Center for Independent Living, even urged increased funding for their centers — an additional $1.1 million in each case. SEIU organizer Stu Dickson (at table) testifies before EOHHS Secretary JudyAnn Bigby at state budget hearing on Friday. A panel of advocates with the Association of Developmental Disabilities Providers simply asked for the budget cuts to stop. “We ask you to remind the governor (who placed $350 million in the state’s rainy day fund earlier this fall) that it’s still raining,” said Gary Blumenthal, president of the organization. Ten thousand families are without support services from the Department of Developmental Services, among the other results of years of budget cutting, he said. FY 13 will be challenging and require cuts and reductions and the need for the Administration to make difficult decisions. Sounds like Administration and Finance Secretary Jay Gonzalez may have already told Bigby to prepare for the worst. Yet, despite the continuing bad budget news, most of those at the portion of Friday’s hearing devoted to DDS issues still apparently retain the faith that the administration’s plan to close four state developmental centers will somehow rescue them. Several speakers praised Bigby for her efforts to phase down the Fernald, Monson, Templeton, and Glavin centers, apparently hoping that the budgetary “savings” in doing so will be directed to their programs. Since FY 09, the administration has cut the developmental center line item in the state buget by more than $45 million. But, as I reminded the audience (including Secretary Bigby) when I got my three minutes to speak, we’ve seen no evidence thus far that the community line items have benefited from the cuts in the developmental center account. Since FY 09, cuts in the community-based accounts include reductions to adult family supports (26.9 percent cut), community transportation (17.6 percent), community day and work (3.8 percent), and Turning 22 (35 percent). As the ADDP has pointed out, direct care workers in the DDS community system haven’t gotten a raise in their relatively meager pay and benefits in four years. Meanwhile, the list of people waiting for community-based residential care in the state has only grown longer as the administration has transferred residents of the developmental centers to community placements. “Where is the promised expansion of the community system” that was supposed to happen as a result of the developmental center closures? I asked Bigby in my testimony. Later, I spoke to an EOHHS fiscal executive at the hearing and got no answer to my question from him either. One of the few at the hearing who understands the extent of the negative impact the developmental center phase-downs have had so far is Stu Dickson, a DDS service coordinator and an organizer with the SEIU Local 509 state employee union. Dickson urged Bigby to restore $5 million to the DDS administrative account, which funds the service coordinators, who arrange for and monitor services for community-based clients. Dickson later said that despite the ongoing closures of the four developmental centers, DDS has not assigned any additional service coordinators to the community system. The department has repeatedly laid off the coordinators, whose caseloads have grown to nearly unmanageable levels. Our question to Secretary Bigby and to the opponents of the developmental centers remains: What has the administration done so far, and what will it ever do, to benefit the community system through the developmental center closures? One of the key functions of the Department of Developmental Services is performed by service coordinators. Their job is to make sure clients are actually getting the services in the DDS community-based system that are specified in their plans of care and for which the state is paying. They also determine the most appropriate sources of services for clients, based on their knowledge of the clients and available programs in the DDS system. DDS even relies on these people to help monitor conditions in group homes. During a phone conversation a couple of years ago, the head of the DDS’s group home licensing office stated that service coodinators ensure that every group home in the state is visited at least six times a year and that conditions in them are checked. Yet, due to repeated budget cuts in recent years, the average caseload for service coordinators has been rising to the point where it is now about one service coordinator to 60 clients. This is more than three times the standard caseload recommended for social workers in this field, according to the SEIU, which organizes service coordinators and other human serivces workers. Perhaps the ADDP will respond here to tell us why the service coordinator positions should be cut further and the caseloads should grow even larger. Could it be that the state-funded providers, who in turn fund the ADDP, don’t really want anyone looking over their shoulder and monitoring the services they are delivering or the conditions in their group homes? These (service coordinator) jobs more then pay for themselves by promoting skill development and greater independence in the DDS population. Left to their own devices, programs settle for providing ‘custodial’ care which perpetuates a burdensome, wasteful and inefficient expense to state government. The SEIU last year tried unsuccessfuly to reopen the federal court case that brought about improvements in care in the DDS system since the 1970s, arguing that the cuts in service coordinators at that time were a violation of a key court order that DDS provide sufficient, adequately trained personnel to meet clients’ needs.